This award-winning set of magnetic words makes it easy to practice writing complete sentences, master difficult grammar concepts, and enhance creative writing skills! The set includes 205 magnetic words, which are color-coded for grammar, and punctuation marks. By simply replacing a green word with another green word, your students can instantly see what a noun's job is in a sentence. Repeat the exercise with verbs, adjectives, pronouns, etc. and watch their reading and writing ability soar! The words included in this set are a well-researched mix of the most commonly used words in the English language (from both the Dolch and the Fry word lists), sight words, rhyming words, and nouns that begin with every letter of the alphabet (great for teaching phonics and letter recognition). 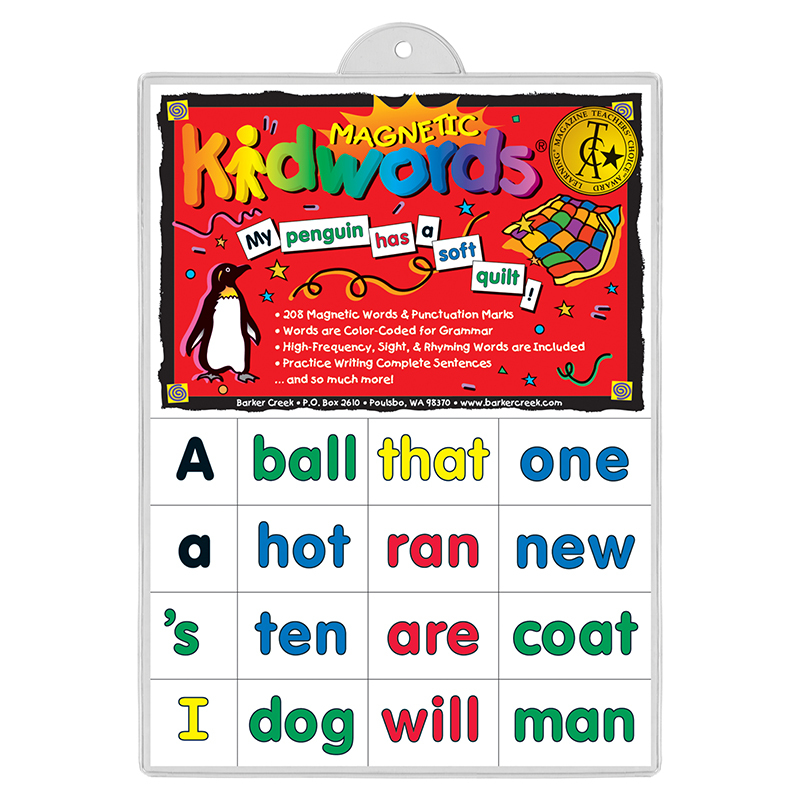 The individual magnets are large enough to be easy to handle (they measure 1" high and the lengths vary depending on the word but average about 2" wide) but small enough so you can write complete sentences on a 9" x 13" lapboard (see our wonderful magnetic-receptive Kidboards!). We offer a complete line of color-coded word sets that can be used in combination with this set making our Learning Magnets line a very powerful, effective, and versatile tool.